Comprehensive review of Walgreens Self Tanning Lotion. See what real experts and actual users have to say about this self tanning product. Overall I ended up giving Walgreens Self Tanning Lotion 2.75 out of 5 stars. It was just slightly better than average. There is a brown guide in it with a slight shimmer, which I actually liked but I don’t think men will. The drying time was amazing, it dried completely in under 10 minutes. The color produced was very natural and even, however it was too light for my liking. But I think if you’re looking for a light glow than you could like the color. The smell is really bad, it smells so strongly of DHA/self tanner. Walgreens Self Tanning lotion feels like a slick, lightweight gel. On the bottle it says it’s a “lotion”, but this one really feels like a gel to me. It has a brown guide in it, and it also has a shimmery look to it. This one goes on smoothly, due to the smooth gel-like feel. It has a brown guide in it, so I’d suggest applying it with gloves, and also being very carful what you touch while applying it. The weird thing about this one is it had a shimmery look to it. Once I put it on, my body has a slight glow to it, I actually liked how it looked. On the bottle it says this is a “quick-dry formula”. I’m always hesitant to believe that, because in my experience gels take a while to dry and you feel sticky in the process. This product definitely proved me wrong, it dried very quickly! It dried completely in under 10 minutes, which I was very surprised and happy about. I didn’t have to wait long to put my PJs on and crawl into bed. I also liked how it made my skin feel, very smooth and supple. It smells overwhelmingly of self tanner. I didn’t smell any hint of a fragrance or perfume, just self tanner. I could still smell the product on my skin a few hours after I applied it, but thankfully the smell was gone the next morning when I woke up. I was actually surprised how natural my tan looked with Walgreens Self Tanning Lotion. The tan was on the lighter side….a light to medium tan, but it was very smooth and natural which I liked. If you’re looking for a very subtle tan, this would be a nice shade for you. I wasn’t splotchy or streaky at all. I would’ve liked to see my tan be a few shades darker, but as far as light self tanners go, this one produced a nice glow. Walgreens Self Tanning Lotion faded pretty quickly. After about 2 days my tan was almost gone, thankfully it didn’t get too splotchy or scaly as it faded. I don’t think this is a good choice for men. First off, it has a very shimmery look to it which I don’t think men will like. And third, the color is pretty light. 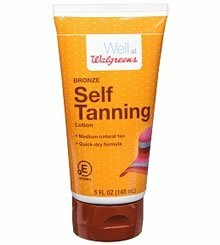 Walgreens Self Tanning Lotion is very cheap at only $1.60 an ounce. The 5 Oz bottle self for $7.99, which is cheaper than most self tanners out there. To buy Walgreens Self Tanning Lotion , Click Here. Look and Feel Feels like a gel. Has brown guide with shimmer in it. Application Make sure you wear gloves, product glides on skin easily. Has potential to be a bit messy. Drying Time Dried completely in under 10 minutes! Smell (Before) Smells terrible, like DHA and self tanner. Smell (After) The bad smell was gone the next morning when I woke up. Color Produced This one gives you a light-medium tan, it’s very natural looking. How Long It Lasts Lasts about 2 days before it completely faded, looks natal as it fades. OK For Men? No, men won’t like the shimmer or the smell. The color may also be too light for them. Price $7.99 for a 5 ounce bottle, that’s only $1.60 an ounce…pretty cheap.